In response to several requests for a VSWR and output power monitor I have developed a simple circuit to be easily added to the BITX (or any transceiver) and some software to get it working. I used a 20 dB directional coupler design, sometimes called a “Stockton bridge”, that is simple, broadband, and requires no adjustment. The sensor circuitry is mounted on a small piece of printed circuit board that is held in place under the mounting nut of the BNC antenna connector, replacing the ground lug that was originally supplied. The (brown) wire from the 2-conductor “ANT1” plug feeds through the center of one toroid core (T1) and solders to the BNC jack, the other (black) solders to the new board's ground plane. Two new wires connect to the Raduino plug for reading and display of the results. I began with a square of un-etched printed circuit board stock, one inch on each side, and drilled a 3/8” hole near one corner to fit over the antenna jack. Leaving enough room for the mounting nut, I glued 4 small pieces of PC board as solder pads. The two transformers are T37-43 ferrite cores wrapped with 10 turns of AWG#24 wire in a single layer. 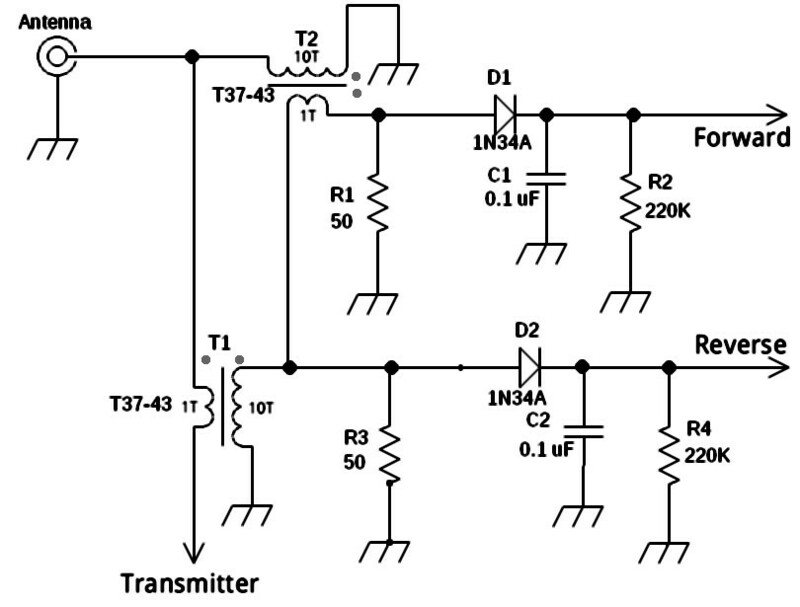 The 50 ohm terminations are ½ watt 51 ohm resistors. I hand-selected two of the ones closest to 50 ohms but this is not critical (what's an ohm between friends?) ¼ watt will work fine at these levels. I used two 1N34A diodes for detectors. I mounted all of the components upright to save space. A short jumper wire feeds from T1 secondary through the center of T2 to the forward detector as that primary winding. Note that you do not wrap this around the core, just pass it through like the antenna lead on T1. Don't have any #24 wire? Use whatever you have that will fit 10 turns. Don't have a T37 core? A T50 or even T60 will work. It is best, however, to stick to 43 mix ferrite unless you adjust the turns accordingly. Capacitor voltage or temperature coefficient is not important. Got lots of room around the antenna connection on your build? Then go large with the PC board and give yourself some space for component mounting and ease of connection. Testing is simple. If windings have the proper polarity then, when you transmit into a dummy load, there should be a couple of volts DC on the “Forward” solder point and a very low voltage on the “Reflected” pad. The coupler works the same in both directions, meaning that if it were built outside of the BITX, then you could reverse it and get the same readings by switching voltage pads. A nice check of operations. 7 watts on my build resulted in a bit over 2 volts volts on the output, well under the maximum 5 volts allowed on an Arduino® A/D input. I included some formulas in the software to average the peaks during SSB operation and displaying it every 3 seconds. The results are also displayed after a half-second key down in straight-key mode. The power reads out as watts in both forward and reverse directions. As usual, the Arduino sketches are available free by emailing ND6T@arrl.net. Not using a digital readout? Just attach meters and adjustment pots to the output connections. If you want just one single-movement meter then use a switch and a trim pot for each switch position. Last, but not least - love Your sketches. Awesome. Looks like everything you need to drive the BitX as a simplified antenna analyzer. With some software to sweep and record. Awesome addition! Email on its way. This looks great, and I hope it has somehow been implemented in the CEC code. The uBitX could be its own antenna analyzer. I am late to the game so I'm sure someone has thought of this. 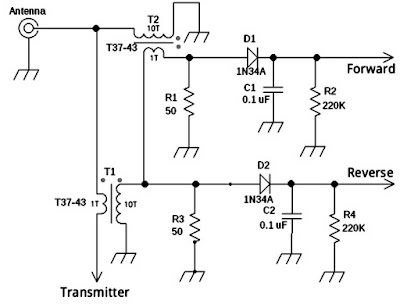 can 1N914/1N4148 diode be used for detectors?